If you’re thinking of coming to SQLBits from outside of the UK, what’s the options available to you? Here is a summary of the sections in this page, and I hope you will find it useful. Any comments or questions, please leave a comment so I can add new detail, to benefit everyone. What is Nottingham all about, then? How do you get from the centre of Nottingham to the East Midlands Conference Centre and Orchard Hotel? Well, it’s the home of the Raleigh Chopper. DH Lawrence was born near here. You may have read Lady Chatterley’s Lover, which is a historical landmark in British legal history surrounding obscenity. In 1960, Penguin actually went to trial for publishing it. Penguin were found ‘not guilty’ due to the novels’ literary merit. Take that, Fifty Shades of Grey! King Charles I started the Civil War near here.His execution led to Interregnum, where England was a republic for a short time. Thought we always had a monarchy? Nope. Take a look at the official British Monarchy website for more information. You can arrive from Manchester, or London airports. Manchester is about 70 miles away from Nottingham. If you come into London, Heathrow is perhaps a better choice than Gatwick, since Gatwick is at the very south of London. Manchester may be slightly cheaper than Heathrow. How do you get from Manchester Airport to Nottingham? Service NX350 – National Express Coach – they operate buses from Manchester Airport. Some services go direct to Nottingham, other services require that you change at Leeds. Here is an example for Service NX350, which takes you from Manchester Airport to Nottingham. This is a long journey though – three hours minimum. Not what you want, if you’ve just had a 9 hour flight from the US. That said, Manchester is a great place to stop overnight if you want to see a different part of England. National Rail might be a better option. It is quicker, at 2.5 hours to get from Manchester Airport to Nottingham. You can get a train from Manchester Airport to Manchester Piccadilly station, and then catch a train from Manchester Piccadilly to Nottingham. Heathrow offers lots of options to get yourself to Nottingham. Paddington to St Pancras then…. St Pancras direct to Nottingham, is probably the simplest. Other suggestions, please leave a comment. The Heathrow Express takes you from the airport to Paddington Station. You can then take an Underground tube from Paddington to London’s St. Pancras station. Here is a map of the St. Pancras area so I’d suggest you take a look at it. Here are two routes, which take about 15 minutes. The reality is that both trains go from Platform 16, and follow the same route. Here is a tube map to help you to see what I mean. From London Paddington take the Hammersmith & City Line (Eastbound, Platform 16) which is a direct service to Kings Cross St Pancras Underground Station. Once you get out of the tube station, you will see the magnificent St. Pancras station. St Pancras International was named after St Pancras Old Church. Dating back to 400 AD, it is believed to be one of the oldest sites of Christian worship in England. Just look for the clock, and you enter the station from the archway. 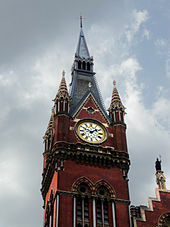 London’s St. Pancras Station is a fantastic example of Victorian Gothic architecture. 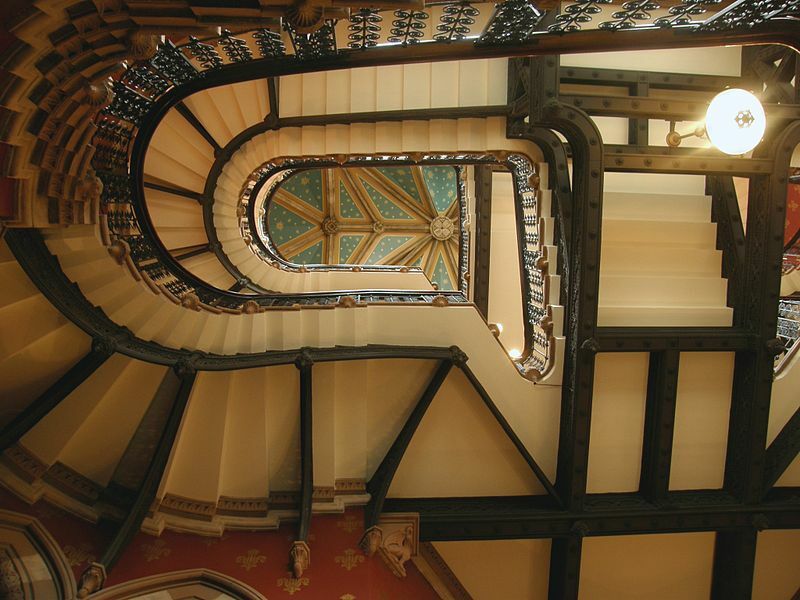 Here is the staircase, inside St. Pancras hotel. It has Betjeman poetry engraved on the walls. Some of the train sheds were bombed during the Second World War, which has only been partially reglazed at the time of writing. Once you get to St. Pancras, you can get your train to Nottingham. To book your tickets, go to the National Rail website. There are some nearly quarter of a million miles of roads in Britain. Many of the roads are built on the old roads laid down by the Romans centuries ago. Roads in Britain range from wide modern motorways down to narrow country lanes usually bordered by hedges, stone walls, grassy banks or ditches. Cities and towns tend to have narrow streets because they date back to well before cars were invented. A lot of towns, like my nearby St. Albans, date from Roman times and were not designed for today’s traffic. There are plenty of car hire places, but I’d suggest that you specify an automatic or you might get a manual / gear stick / gear shift or whatever you call them. We also drive on the left hand side of the road in the UK. Why? Because it’s the law. Don’t text / tweet / talk on the mobile (cell) whilst you drive. If there are two lanes: if you’re turning right, go into the right lane. If you’re turning left or straight ahead, use the left lane. This is the rule, unless the road markings say otherwise. Always give way to the person coming from the right. He has priority over you. Let any traffic from your right, go first. Then you go. The people on your left hand side…. they’re waiting for you. Any questions, please leave a comment and I’ll pick it up here, for everyone’s benefit. This entry was posted in Speaking Events, SQLBits. Bookmark the permalink.